Why not combine two of Portugal’s most vibrant cities, Lisbon and Porto, within one trip using train travel in between? Lisbon, Portugal’s capital, and Porto - the country’s second city, offer cultural breaks as well as a host of diverse and plentiful activities from excellent shopping opportunities, a rich and interesting heritage, a contrasting cityscape and picturesque scenery to atmospheric alleyways and districts, bountiful food markets, excellent cuisine, and easy access to several beaches. Our suggested itinerary is not set and can be amended to suit individual requirements. On arrival at Lisbon airport, you will be transferred to your hotel. Guests staying at the Heritage As Janelas Verdes Hotel for 2 nights or more receive complimentary entrance to 20 museums in Lisbon (Nov-Mar). Popular museums include the Calouste Gulbenkian Museum, housing an excellent private art collection with pieces by Rembrandt, Rubens, Monet and René Lalique; the Berardo Modern Art Museum; the National Museum of Ancient Art; the Fado Museum and the National Tile Museum. Guests also receive one free train ticket to Estoril or Cascais, and a journey on the Elevador da Bica (Funicular) which takes you up to Bairro Alto and Chiado. Overnight at the Heritage As Janelas Verdes Hotel, Lisbon. Day at leisure. See the sights of Lisbon onboard the vintage yellow trams that criss-cross the city. These trams operate a hop-on and hop-off service with 30 stops and provide access to the Castelo São Jorge with its stunning views over the city which should not be missed. Visit the district of Belém where you will find monuments and museums dedicated to the Portuguese explorers and their discoveries. The Belém Tower, on the banks of the River Tagus, is one of the most photographed sights in Lisbon, and nearby is the Discoveries monument and the Jerónimos Monastery. Belém also has another claim to fame - the delicious ‘Pasteis de Belém’ a traditional Portuguese custard tart. Use your free train ticket (when staying two nights or more at the Heritage As Janelas Verdes Hotel) to explore the coastal towns of Estoril and Cascais. Head to the beach for the day or simply explore these enchanting towns. After breakfast, self-transfer to the train station for your train journey (2 hours 44 minutes) north to Porto (1st class train ticket included). Self-transfer on arrival to the Infante de Sagres Hotel. The Infante de Sagres is a grand 5-star hotel which has been welcoming guests to the city since 1951. It still retains an atmosphere of a bygone era with stain glass windows and many elegant period features. Overnight at the Infante de Sagres, Porto. 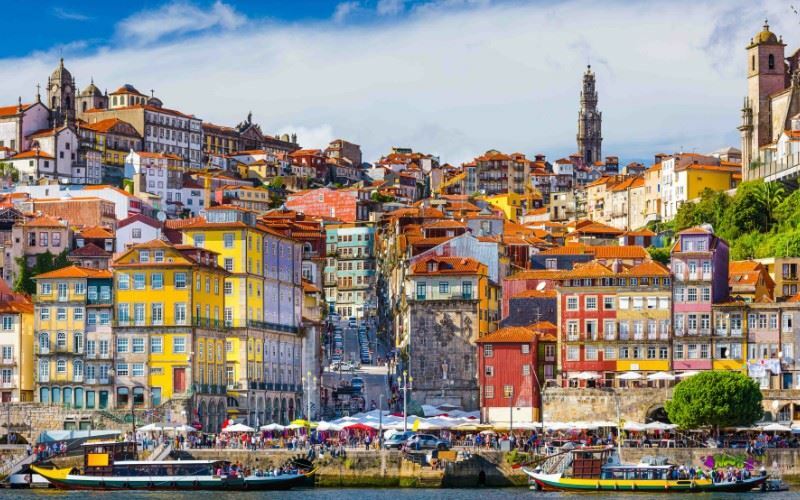 Time to explore the delights of Porto: the Ribeira district; the Sao Francisco church - known for its lavish baroque interior and ornate gilded carvings; the 12th century Cathedral and the iconic Clerigos Tower. Take a stroll along the river bank and capture stunning images of the city from the Dom Luis I bridge. You can shop until you drop on Rua de Santa Catarina and Avenida da Boavista. And, for wine connoisseurs the Port Wine cellars at Vila Nova de Gaia are a must. Venture in to the fabulous UNESCO World Heritage Site of the Douro Valley by train or boat - bookable locally. The winding river of the Douro flows through a majestic landscape of terraced vineyards where the port grapes are grown. Private transfer to Porto airport for your return flight back to the UK. This beautiful late 18th century aristocratic mansion, formerly the home of the Portuguese novelist Eca de Queiroz, has been converted into a charming and exclusive hotel. This beautiful late 18th century aristocratic mansion, formerly the home of the Portuguese novelist Eca de Queiroz, has been converted into a charming and exclusive hotel. The property is full of character and c.20- minutes walk from the central Rossio area. The Museum of Ancient Art is well placed next door. 29 air-conditioned rooms including classic rooms and superior bairro rooms. The Infante de Sagres, a member of the ‘Small Luxury Hotels of the World’ and the first 5-star hotel in Porto, has been welcoming guests to the city since 1951.